Ocean Journey. This game includes questions relating to fish, the ocean, and activities associated with the ocean. Animals Everywhere. This game includes questions relating to familiar animals. Food Feast. This game includes questions relating to fruits, vegetables, meat, dairy products, etc. Rodeo Fun. This game includes questions relating to the people, objects, and events commonly associated with the rodeo. Outer Space. This game includes questions relating to space travel, the planets, flying saucers, etc. Park Adventure. This game includes questions relating to activities, events, and objects commonly associated with parks. Going Places. This game includes questions relating to transportation vehicles, how they operate, their component parts, etc. Toys and More Toys. This game includes questions relating to characteristics of toys. Sweet Adventure. This game includes questions relating to ice cream, candy, and other sweet foods. Circus Day. This game includes questions relating to the people, animals, and activities commonly associated with the circus. Sound Fun. 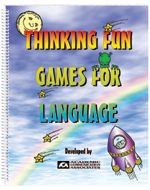 This game includes questions that can be used to stimulate the production of any speech sound. On the Farm. This game includes questions relating to animals and activities on the farm. Day at the Beach. This game includes questions related to activities that people do at the beach. In the Kitchen. This game includes questions relating to appliances, food, and other items found in the kitchen. Let's Go Shopping. This game includes questions related to people and items encountered when shopping for groceries. Sports Time. This game includes questions relating to baseball, football, and other familiar sports. A downloadable version of this product is also available from us. See Related Products link below.